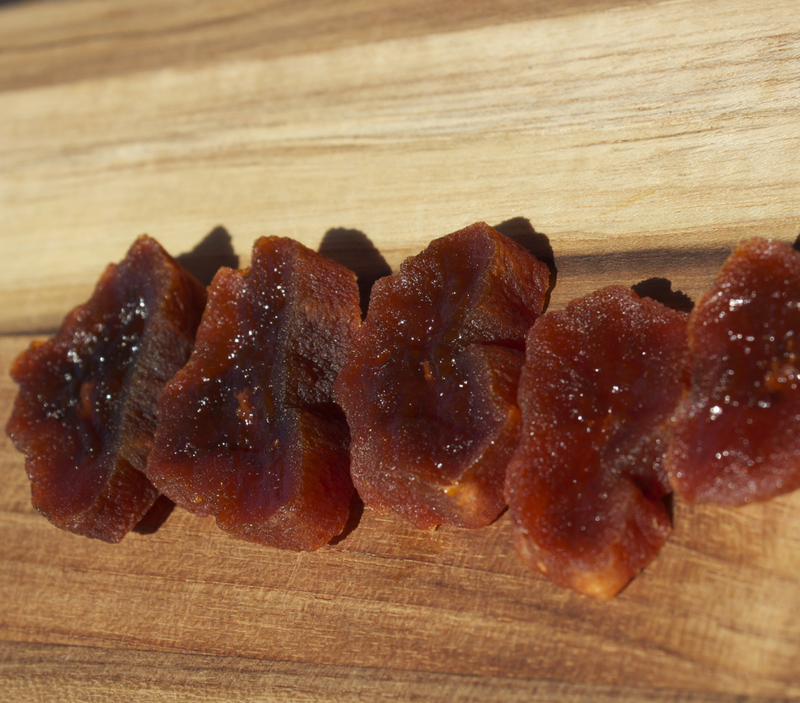 Subtle, sweet, complex, mellow and addictively delicious Dried Persimmon – YES. It’s Halloween, and in the bay area, backyard persimmons are at the best state of ripeness for drying: orange, but still hard. Once they begin to soften, they’re too ripe to use for this technique. I’m re-posting this recipe to help get you inspired. When to pick the fruit is key, and the time is upon us. 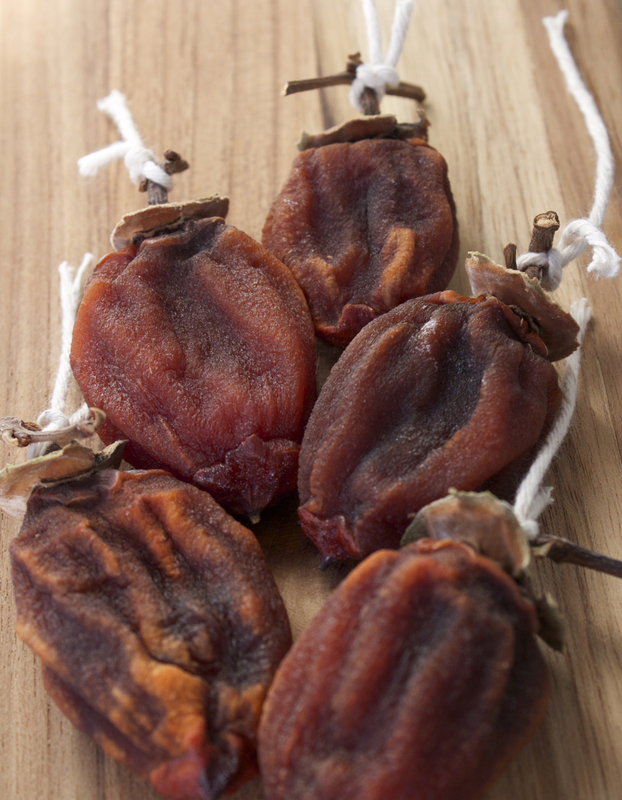 I LOVE Dried Persimmon when served with good cheese (manchego is fabulous) and a quality sherry for a lux happy hour. Enjoy! My friend Janet has a mature Hachiya persimmon tree in her backyard, which produces lots of beautiful fruit each Fall. I’ve picked the dark orange mature fruit, when they are the consistency of jelly, and made the puree into cakes and other confections. Two years ago she learned a simple technique for drying these fruit, a practice that hails from Japan. A stunning natural transformation occurs when these supremely astringent unripe fruit are peeled and left to air dry for several weeks: they turn into a most delicious, delicate, sweet natural confection. 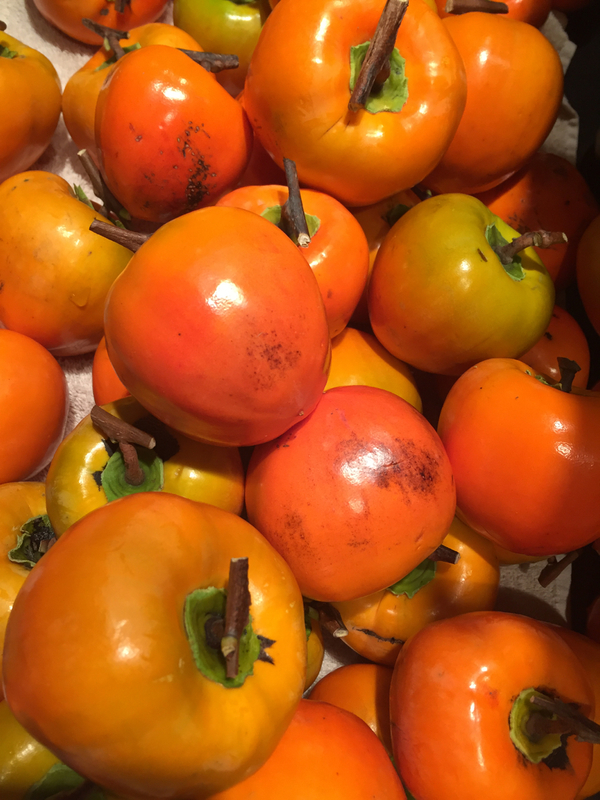 Here’s what to do, if you find yourself with a big crop of Hachiya persimmons one Fall. Pick the persimmons when they are bright orange all over and still quite firm and opaque. Keep a cross-shaped section of the branch on which the fruit hangs — you will need this to secure string for hanging. Clip the sepals to a neat circle on the top of the fruit. Peel the thin skin off the whole fruit, leaving a dime sized patch at the base. Secure a string on the stem of the fruit from which to hang the fruit. Hang each fruit so that it doesn’t touch its neighbor. Good air circulation is key. 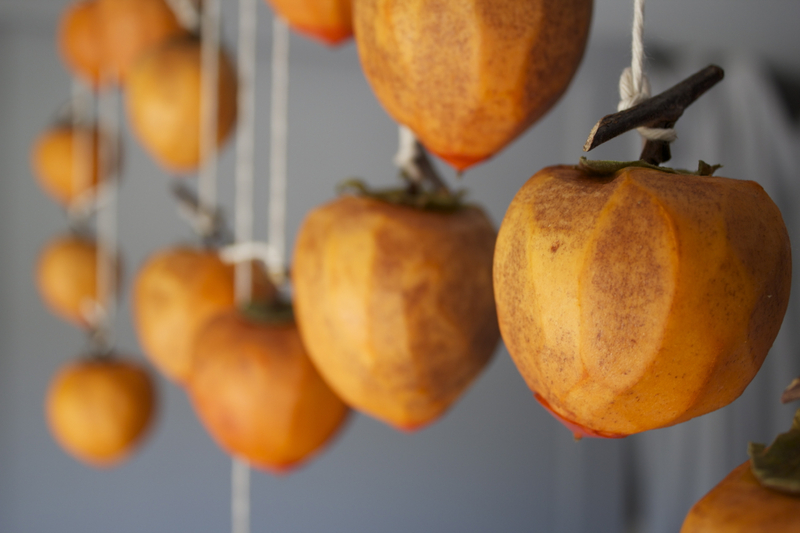 Hang the peeled persimmons in a warm dry room. I hung a wooden closet dowel from some bike hooks I screwed into the ceiling, then secured the strung persimmons to this dowel. I had 50 fruit, which was pretty heavy to begin with. 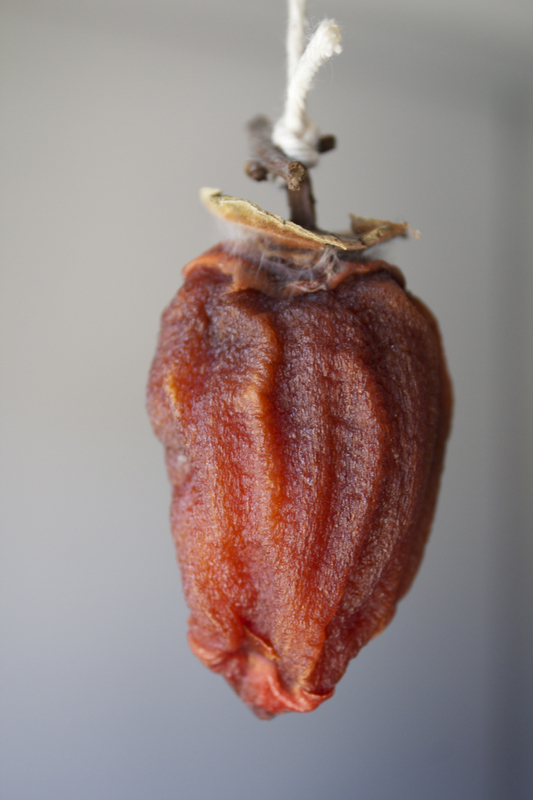 Over the course of several weeks the fruit will turn darker, and shrink, then pucker. Some of the fruit may drop off — so it’s wise to place a towel under them, just in case. When the fruit is about 1/2 as big as original, give each one a gentle massage. This will help to distribute the moisture for even drying. As long as the fruit doesn’t smell sour it’s good! When the fruit is the consistency of a soft gummy bear, it’s ready to eat. Slice into pieces and enjoy! I haven’t had the opportunity to have persimmons in forever! Didn’t know u could do that! Awesome.